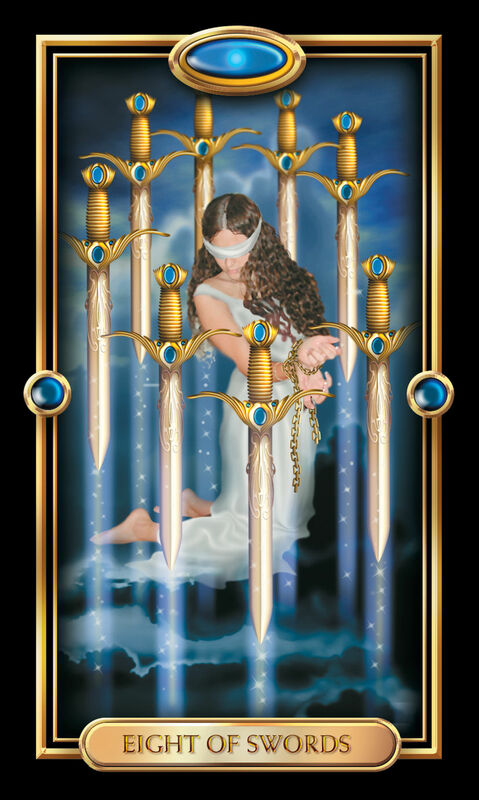 The Eight of Swords shows a person who has put himself in chains with her own thoughts. This card may mean that you are perceiving yourself as limited, oppressed, helpless or obligated when in fact you are not, or it may simply mean that the way that you think about your circumstances is constricting and self-defeating. The card may at first look bleak and threatening— just as, probably, your circumstances do— but that is only before we realize that her legs are not tied, and so she could easily walk away at any time. Furthermore, even though there are eight swords which seem to fence her in, none are wounding her in anyway, and none are even particularly a threat. The sight of the Swords looks scary, but it is not actually dangerous at all. Actually, if she would only shake off the blindfold (which she is either voluntarily or involuntarily wearing), she might use the swords to cut the ties which bind her and walk away perfectly free. There is a metaphor in this. Swords represent, among other things, thoughts and facts. We can allow thoughts and facts to constrict, control, threaten and even hurt us; this is especially true when we are ignorant, vulnerable, unconscious or willfully ignoring our circumstances, as symbolized by the blindfold. But these very same facts, if we would only change the way we perceive them, might be worked to our advantage, just as our thoughts, which sometimes torment and imprison us, can also be transformed into tools to make ourselves feel wonderful and free. The card can symbolize confusion, and the sorts of negative situations that arise from not being clear about who you are, what you want and what you need. If you are not yourself clear within, you can only expect to be battered around and limited by the conditions around you. It may also symbolize disempowerment or oppression, the chief strategy of governmental oppression being indoctrinating masses of people with the belief that they are powerless without a higher authority (represented by the looming castle in the background). The individual in the picture has been convinced that she is helpless and under the dominion of others, when in fact she is perfectly free to leave, and there is not even any one else around. This does not only apply to the extreme condition of tyranny, but to almost any negative circumstance in our lives. Remember your own power. You are never powerless. Changing your conditions for the better is always within your reach. The Eight of Swords card is connected to Saturn in the 4th house, as a symbol of internal barriers. The Eight of Swords card can indicate that you might be stuck and unable to move forward due to confusion or not knowing what is going on around you. You may feel as though your instincts are being overruled by other people in your life. When the Eight of Swords is reversed, it can represent failure to move forward in your life due to self-doubt, fear, and isolation. It is possible you may even know the way forward, but you choose to stay put and escape in your mind instead. You may be unhappy with the current state of your life, and wishing that you could return to a time in the past when you were happier. The Eight of Swords card can represent a time of decisive changes in your work life. If you do not feel fulfilled or happy at your job, then you may need to believe in yourself and harness your power to control your life and change your work situation. If you do not wish to leave your current job for some reason, then you may need to find a way to put up with things as they are. The Eight of Swords can indicate that you need to seriously reevaluate a relationship in your life. If you are staying with someone who is not a good fit for you to avoid being alone, then it may be time to rethink your position to understand if being alone it worse than an unhealthy relationship. If you are looking for love, you may need to look at how well you are able to love yourself and tend to anything you need to be open to and capable of loving someone else as well. The Eight of Swords card can indicate that you may need to beware of self-fulfilling prophecies in your life. If you believe that your bad financial luck will never change, then that may become a reality that you create in your life. Now is a good time to consider your skills and explore new income streams. Expecting the best, but being prepared for the worst may help you create a positive financial reality. The Eight of Swords card represent the spiritual answers that you may already have inside yourself and your soul. You may find great peace by meditating and seeking signs and signals from the universe by subtly repeating a phrase or song.